If you find yourself with leftover pumpkin puree this season, here’s a cake for you. A moist, delicately spiced cake slathered with cream cheese frosting – not too much, we went with the exposed sides look – that’s perfect for this time of year. And the layers freeze well, so you can pack them away for the holidays. As a bonus, frozen cake layers are easy to frost, with minimal crumbs! In a large bowl, beat the butter, oil and brown sugar until pale and light. Add the eggs and vanilla and beat until well combined. Beat in the pumpkin puree - it may look separated, but that’s OK. In a smaller bowl, stir together the flour, baking powder, baking soda, cinnamon, ginger, nutmeg, allspice and salt. Add to the pumpkin mixture and beat on low or stir by hand just until combined. To make the frosting, beat the butter and cream cheese until smooth. Add the icing sugar and vanilla and beat until you have a spreadable frosting, adding a spoonful of water if it’s too thick, and a little extra icing sugar if it seems too runny. In the cakes are domed on top, slice off the domed part with a serrated knife to make more even layers. 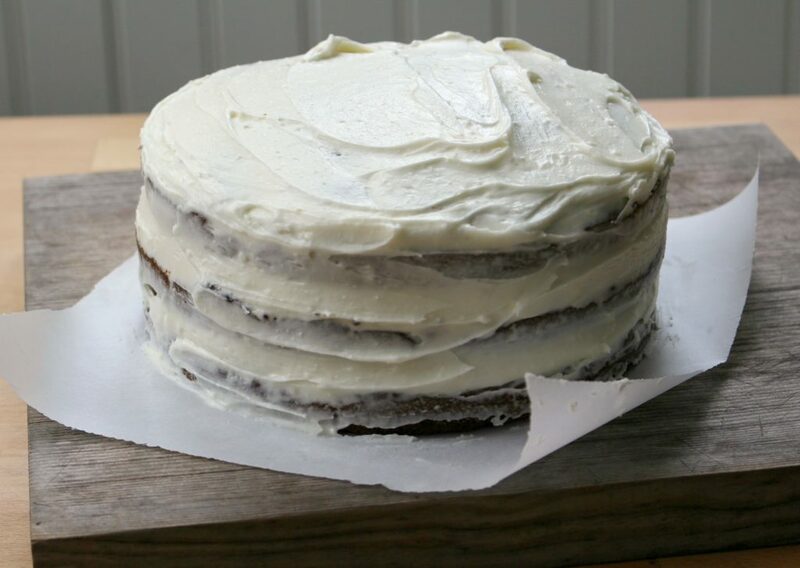 Spread the frosting over the cake, thinly on the sides to allow the layers to show through. Makes 1 cake; serves 12. Posted in Desserts and tagged cake, pumpkin.